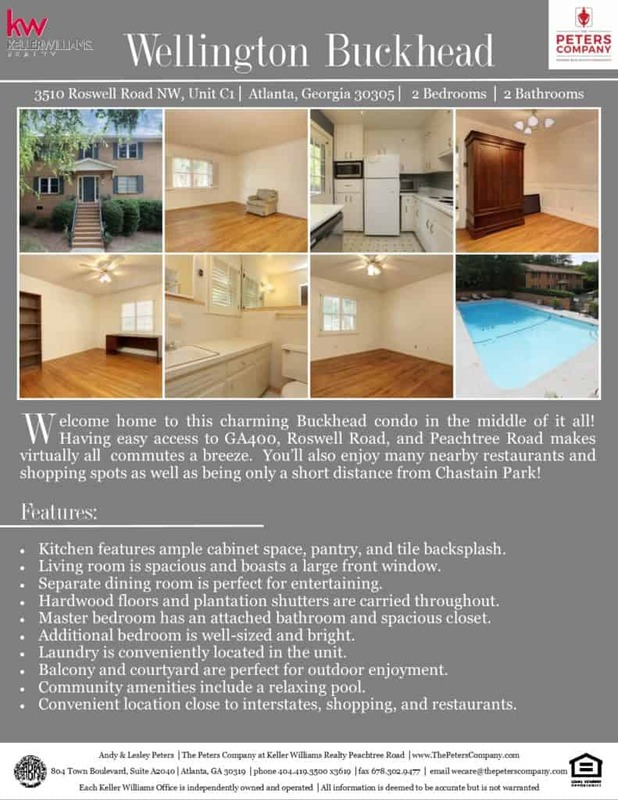 Just Listed :: Charming Condo at Wellington Buckhead! Welcome home to this charming Buckhead condo in the middle of it all! Having easy access to GA400, Roswell Road, and Peachtree Road makes virtually all commutes a breeze. You’ll also enjoy many nearby restaurants and shopping spots as well as being only a short distance from Chastain Park! Kitchen features ample cabinet space, pantry, and tile backsplash. Living room is spacious and boasts a large front window. Hardwood floors and plantation shutters are carried throughout. Master bedroom has an attached bathroom and spacious closet. Additional bedroom is well-sized and bright. Laundry is conveniently located in the unit. Balcony and courtyard are perfect for outdoor enjoyment. Community amenities include a relaxing pool. Convenient location close to interstates, shopping, and restaurants. ← Just Listed :: Beautiful Traditional in Vinings Place!